Manufactured from extra-strong polycarbonate to provide strength and enhanced flexibility. Designed for long-lasting use around the farm, ranch, and home. Specially designed tines are uniquely angled to provide easy manure pick up with less spilling. Nylon locknut secures 52 inch handle. Fork head is 13 1/8 inch long and 15 1/8 inch wide. Manufactured from extra strength polycarbonates to provide long lasting strength and enhanced flexibility. The specially designed tines are uniquely angled to provide easy manure pickup with less spilling. Fork head is 13 inches long and 15 inches. Handle is 52 inches long. Manufactured from extra strength polycarbonates to provide long lasting strength and enhanced flexibility. The specially designed tines are uniquely angled to provide easy manure pickup with less spilling. Fork head is 13 inches long and 15 inches. 52 inch lightweight idiodized handle. Basket design helps prevent manure from slipping off the fork. 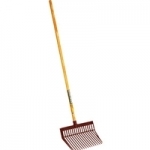 Smaller 42in.handle makes it ideal for kids and small adults. Works great in confined spaces like horse trailers and small stalls. Fork head is 12.25 inches long and 11.5 inches wide. Basket design helps prevent manure from slipping off the fork. Our largest fork with 33% more carrying capacity than DuraPitch 1. 52 inch handle, fork head is 13 inches long and 16 inches wide. One piece forged blade for durability. 30 In. Ash wood handle with steel and wood D-grip. Forged with Flex Beam, Ash Handle, 4 Oval Tines, 12-1/2 inch X 8-1/4 inch Spread at Points, 10 inch Ferrule with Cap, 48 inch Handle. 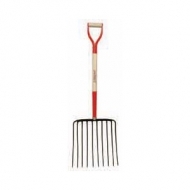 Razorback manure fork with flex beam, 48 inch ash handle, 5 oval tines, 12-1/2 inches long, 9 inch spread at points and 10 inch ferrule with cap. Fork features an ash Handle, 7-3/8x11-1/2in heavy duty 4 tine head, 8in ferrule with cap, 30in handle with steel and wood D-grip.